So on a day that Pep Guardiola's new side lose to Leicester, his current side fail to score. I'm going to leave you there - that's for joining me for a game that won't be remembered for very long. 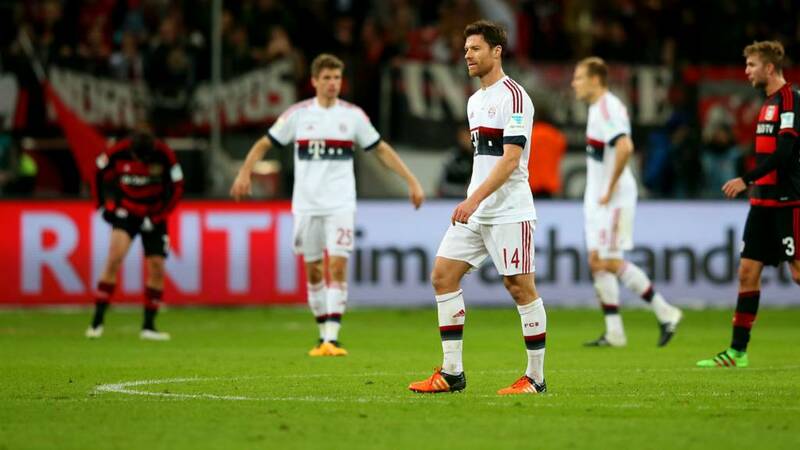 Bayern Munich fail to win a game for only the third time in 20 Bundesliga matches this season. But they still go eight points clear of Borussia Dortmund at the top. This game is petering out. Bayern Munich midfielder Sebastian Rode has a half-chance to win the game with his first touch and the ball bounces to him at the edge of the box but his shot goes wide. Bayern boss Pep Guardiola tries to shore things up, sensible midfielder Sebastian Rode replacing winger Kingsley Coman. And Bayer Leverkusen also make a switch, Admir Mehmedi coming on for Karim Bellarabi in attacking midfield. Bayer Leverkusen have a great chance to win the game, but substitute Julian Brandt blasts a shot wide of the far post after Thomas Muller's poor header. Well, Xabi Alonso was the first player booked. And he's the second too. The Bayern Munich midfielder catches Javier Hernandez in the centre circle, and Bayern end the game with 10 men. Robert Lewandowski, on his 50th Bundesliga appearance for Bayern, has a great chance to make it 1-0 after a defensive error but it goes wide. Kartik Venkat: I think I see a potential defensive transfer target for Liverpool - Toprak. Omer Toprak, who has been brilliant at the back for Leverkusen, does brilliantly to tackle Douglas Costa as he was breaking into the box. The corner comes to nothing. Time is running out. Has Guardiola made the right decision? The first-half tally of two shots was a joint-record low in the Bundesliga since Opta started recording stats in 2004-05. We've had nine in an open second half. Bayern Munich midfielder Xabi Alonso is the first player booked - for the 25th foul of the game. Nobody can accuse the referee of being trigger happy with his cards. In the last 51 Bundesliga games between these sides, there has been at least one goal. The last 0-0 was in 1990. Bayer Leverkusen make a change in their attacking region - Stefan Kiessing comes off for highly rated teenager Julian Brandt. David Alaba finds Thomas Muller with a brilliant flick, Muller swivels but his shot is blocked by a defender. That'll be Aleksandar Kolarov and Fabian Delph next season. Great defending from Bayer Leverkusen. The ball breaks to Thiago in the box and a defender throws himself at the shot to get it out. Bayern Munich are yet to have a single shot on target by the way. Leverkusen have had two. The hosts lead 5-4 on shots too.